Former DMNA Council member John Bach recently suffered a heart attack. We wish him and his wife Thea Bach, a current DMNA Council member, the best. John and Thea would appreciate your prayers and best wishes. It’s a little late in the season, but there’s still an opportunity to plant a garden plot in Marlborough Park and get a harvest. 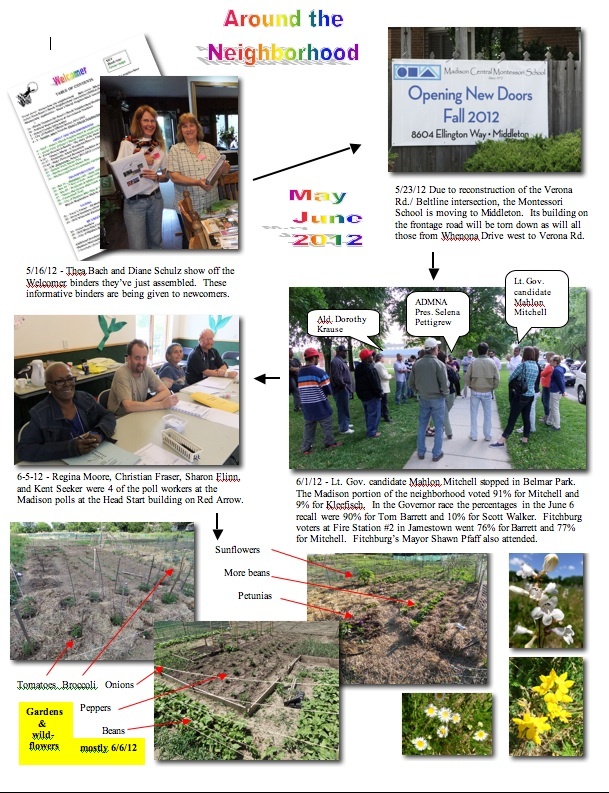 Plot D5 in the large tilled part of the community garden has been abandoned and can be rented. It has a sign on it for those who want to check it out first. Contact Micah Kloppenburg at 246-4730, ext. 236 to sign up for this plot. Bedding plants such as tomatoes, cabbages, or peppers would probably do well as would green beans planted from seed or onion bulbs. It’s probably too late to start carrots, radishes, peas, or most other seeds that are more dependent on cool weather to get a good start. The Dunn’s Marsh Neighborhood sign project lurched forward two more notches recently. On May 15 City of Madison Common Council approved the location of the sign on the Beltline Frontage Road near Seminole Highway. It will be located in the right of way 8 feet back from the curb in front of Midwest Financial. A previous plan to locate the sign on Seminole Highway itself turned out to be infeasible due to the lack of right of way and obstructions on the adjacent property. This week the DMNA sent a check for $1,433 to Cary Signs to start the process of designing the sign. That amount is half the cost of designing, producing, and installing the sign. It was a required deposit to initiate the work. The money will eventually be reimbursed from a City grant. The sign will be horizontal, 3x6 feet, and no taller than 5 feet. Landscaping will complete the project but probably won’t be installed until fall. Besides the DMNA Council, the most active neighbors working on this project are Kent Seeker, Mary Mullen, and Susan Kilmer. The sign has been in the works since 2010. The recall election for the Governor and Lt. 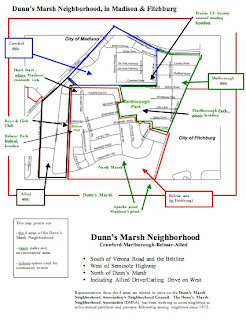 Governor drew many voters in the Dunn’s Marsh Neighborhood and all over the state. We had a near-record turnout from our neighborhood. In the Madison portion, 678 of the 940 registered voters cast votes for a turnout of 72.1%. 161 voters registered at this polling place on Election Day. Overall City of Madison turnout was 73 %. The turnout at the Fitchburg District 1 polls at the Jamestown Fire Station was 76.7%. 455 voters registered at this polling station on the Election Day. District 1 has voters from Wards 1-4. The Fitchburg part of our neighborhood is Ward 1. The overall Fitchburg turnout was 80.8%! Although the outcome is old news, political aficionados may be interested to learn that the Madison part of the neighborhood voted 90% for Tom Barrett for Governor and 10% for Governor Walker. The count for Lt. Governor was 91% for challenger Mahlon Mitchell and 9% for Lt. Governor Rebecca Kleefisch. It’s not possible to know how the Fitchburg part of the neighborhood voted specifically, since 4 different Fitchburg wards vote at the Jamestown Fire Station #2. However, the overall vote at that Fitchburg polling location was 76% for Barrett and 24% for Governor Walker. In the Lt. Governor race, Mahlon Mitchell got 77% of the vote and Lt. Governor Kleefisch tallied at 23%. By comparison, the County voted 69% for Barrett (30% Walker) and 70% for Mitchell (30% Kleefisch). 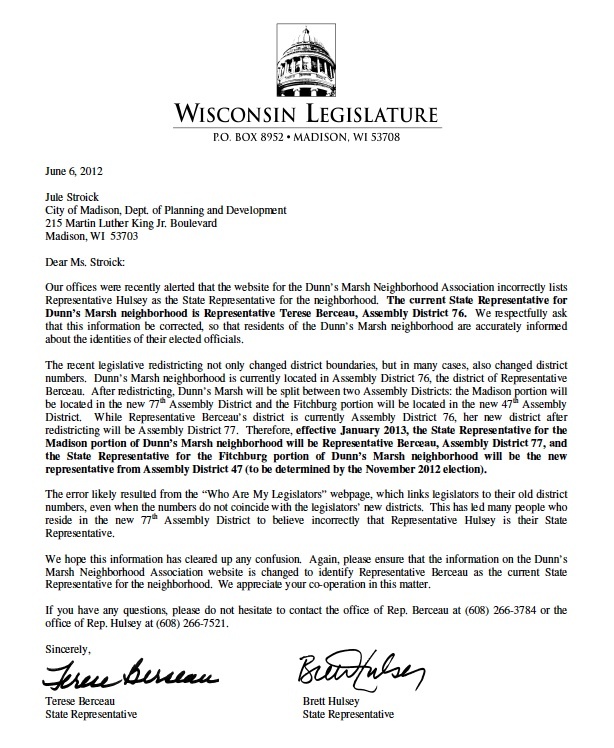 Had it been up to our neighborhood, or Dane County, for that matter, we’d have a new Governor and Lt. Governor. The City of Fitchburg is sponsoring a Public Information Meeting on the Cannonball Path Phase 2 & 4. This will be an opportunity to see preliminary plans, discuss the project with City staff and the design consultant, and provide input on the project. Time: Open House: 6:30-7:00 p.m. The Cannonball is going to be a very important connector for the areas south of the Beltline between Fish Hatchery and Verona Rd. It will more or less parallel the Cap City Trail, but with fewer steep grades and better access to some underserved residential areas. The path goes right by Leopold Elementary School, which is going to provide a fantastic route to school for those kids (and their parents and teachers.) Also, there will be a new bike-ped crossing of the Beltline just east of Todd Dr that is much needed. For many more details about the path, read the next article. The City of Madison, City of Fitchburg and the Wisconsin Department of Natural Resources (WDNR) began planning in early 2005 to develop a paved, multi-use path on the abandoned Union Pacific Railroad (formerly C&NW) corridor. This railroad begins where the Military Ridge Trail diverts out of the railroad corridor at the Weight Station along Verona Road, south of McKee and goes northeast across the beltline (USH 18/12/151) east of Todd Drive to about 1,000 feet north of the Beltline. The operator, Wisconsin & Southern Railroad (WSOR), applied for abandonment in 2005. Madison acquired the property under a Rails-to-Trails agreement in 2008. WDNR awarded a Stewardship grant covering approximately half the $2.4 Million purchase price. The full project will be a 10-foot wide, paved path 4.5 miles long, with an additional 0.4 miles of paved connecting paths including the Apache Boardwalk which provides a connection to the Belmar neighborhood. It will significantly improve local and regional bike / pedestrian mobility, connecting large neighborhoods in Fitchburg and Madison to downtown Madison (via bike lanes on Fish Hatchery Road). A segment of the new path may be designated as the Capital City Trail, replacing an existing segment that has poor geometrics. connect large residential neighborhoods in both cities to each other, to the UW Arboretum, Leopold Elementary School, Dunn’s Marsh and other conservancy lands, to parks and other destinations. On an annual basis over 100,000 trips are expected on this facility, many of these primarily for transportation purposes. Project benefits include safety, improved bike and pedestrian mobility, economic development, tourism and reduced traffic congestion on alternatives routes. Offstreet paths elsewhere in area have shown potential to attract significant numbers of commuters to non-motorized transportation modes, reducing automobile trips with resulting noise and air quality benefits. There will not be trail user fees for this path, and it will be snowplowed for year around use. The first phase of this multi-phase project was completed in 2010 by the City of Madison. This phase was from the Capital City Trail in the Highlands of Seminole northeast to Greenway View in the City of Madison. Madison is currently designing Phase 3 for construction in 2013; a bridge over Beltline Highway. This bridge project will include extending the path from Greenway View to over the Beltline. Ultimately the City of Madison plans to extend the path to Fish Hatchery Road along the same corridor. The remaining sections of the path, Phases 2 and 4, extend from the Military Ridge Trail northeast to the section of path built last year by the City of Madison. We have received Federal Transportation Enhancement (TE) funding in the amount of $480,000 for this section of path. The local share is $330,000. The City of Madison was responsible for design and construction of Phases 1 and 3, while the City of Fitchburg is responsible for the design and construction of Phases 2 and 4. It should be noted that segments of Phase 1 and 2 include joint jurisdiction between the municipalities. The Memorandum of Agreement identifies a cost sharing arrangement for these two segments. We have a total of $810,000 in the CIP for this project. Of this; $480,000 is the federal funding, $177,000 is borrowed; and a fund balance of $153,000 for an easement that was acquired by the Madison Water Utility within the corridor. engineering, finalize the plans and prepare the Programmatic Environment Document required by the DOT for the federal funding. This will allow the project to be able to proceed in fall of 2013. Boardwalk from the Cannonball path to Crescent Road which will provide a link to the Belmar neighborhood adjacent to the recently constructed Apache Pond. amount of $43,500 for the design of the Cannonball path including the design of the Boardwalk connection and the path lighting. Whalen Road is being resurfaced between Fitchburg Road and Fitchrona Road at the west edge of Fitchburg, just a few miles south of the Dunn’s Marsh Neighborhood. In addition, paved bike lanes are being added to Whalen between Seminole Highway/Badger State Trail Crossing and Fitchburg Road. Pavement markings and signage will follow. There are no bike lanes planned for Seminole south of Lacy in the near term. These were lowered in priority due to the parallel Badger State Trail. Also in Fitchburg’s 5-year capital improvement plan are paved bike lanes around the rural part of the City of Fitchburg on up-hill stretches such as the one leading to the summit on Whalen just east of Fish Hatchery. A neighbor with a view of Marlborough Park reports that cars continue to use the park’s bike path and are also parking next to the shelter. Park rangers in their white vehicles and City authorities are allowed to use the bike path for their official business and duties in the park, but no private person is permitted to drive into the park. Don’t drive in the park, and if you notice anyone doing so, take down their license number and call the Madison City Park Rangers at 235-0449 or the non-emergency police at 266-4275. It’s also a good idea to keep a log of illegal drive-throughs since police or park rangers usually can’t get to the park before the vehicle has passed through and disappeared onto the streets. If we can establish a pattern of violation, the rangers and police can do a better job of keeping these cars on the streets where they belong. All gardeners arriving to work on their plots should park on the street and walk in. Dogs are not allowed to run loose in Marlborough Park. Dogs are welcome if they are on leash and on the pedestrian/bike path. They are not allowed to be running loose dragging their leashes. Roundabouts are a fairly new traffic device in the United States. I’ve used them rather tentatively. One neighbor has told me - in the context of the plans to have a roundabout under Verona Road - that she will never use one. Like them or not, I recently read in the On Wisconsin alumni magazine, that University of Wisconsin research shows they drastically reduce traffic accidents that cause injury and death. The UW’s Traffic Operations and Safety (TOPS) Laboratory studied 24 Wisconsin roundabouts between 2009 and 20011. The study found that accidents causing injury and death had decreased by 52% compared to the traditional intersections. There was an increase in minor collisions, those that damaged vehicles but didn’t hurt or kill people. In roundabouts, motorists enter the circular intersection by turning right. They also exit to the right. The traditional intersection has motorists go through an intersection either straight across or by turning right or left. Cars can hit head-on or one can crash directly into the side of another. There are about 50 roundabouts in the state now with another 100 planned in coming years. A nearby roundabout is near South Towne. Another is at the intersection of Mineral Point Road and Pleasant View Road on Madison’s west side. Mt. Horeb has several. The one planned as part of the Verona Road/Beltline project will permit Dunn’s Marsh residents to get to the other side of Verona Road or get on Verona Road going west. It will also allow motorists coming off the Beltline or going west on Verona Road to enter our neighborhood. 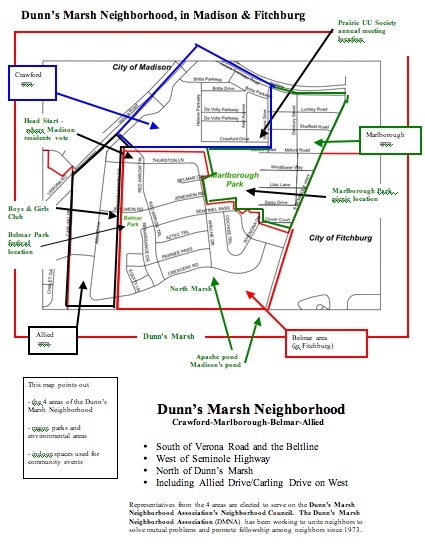 You’d think it would be easy for the City of Madison computer wizards to go into their database and correct an error in the name of the Assembly Representative on the page they keep on the Dunn’s Marsh Neighborhood Association. 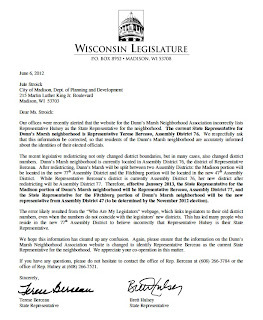 Even a letter from our Assembly Representative Terese Berceau that was also signed by Assembly Representative Brett Hulsey - who was incorrectly listed - did not do the trick. Now the City website does not list any State Representative or Senator. However, after a flurry of e-mails it now links readers to “Who Are My Legislators?’ on the State site <http://legis.wisconsin.gov/w3asp/waml/waml.aspx> <http://legis.wisconsin.gov/w3asp/waml/waml.aspx> . Readers simply put in their address in the blanks. While two sets of answers come up, only the first set is correct. One has to wonder why a human being can’t go in and make a simple correction. The answer is that this part of the database is automated, and doesn’t allow individual names to be put it. Apparently we will have to wait until November for this error to automatically self-correct. Meanwhile, be assured that Terese Berceau [Ber-so'] is indeed our State Assembly Representative, and Fred Risser is our Sate Senator. You can contact Representative Berceau at (608) 266-3784, Rep.Berceau@legis.wi.gov <mailto:Rep.Berceau@legis.wi.gov> , or by mail at 127 West, State Capitol, P.O. Box 8952, Madison, WI 53708. Her office is 127 West in the capitol. Senator Risser’s contact information is (608) 266-1627, Sen.Risser@legis.wisconsin.gov <mailto:Sen.Risser@legis.wisconsin.gov> , or by mail at Room 130 South, State Capitol, P.O. Box 7882, Madison,WI 53707-7882. Mary, I do wish this was a simple fix [getting the correct State elected representatives on the neighborhood association website]. The automotive system is based/runs off of our GIS address based system. We do not have the ability to go in and override (change out) a name. That would be too easy! The “Neighborhood Website” is scheduled for upgrade later this year. I will address with our IT Department the issue of neighborhoods that cross municipal boundaries. I will advocate to have our two municipalities enter into an agreement (or whatever it takes) for the of City of Fitchburg to provide data access/maintain the portion of the site that lies within their jurisdiction. This is to let our friends know of the Jamestown Neighborhood Garage sale on June 15 and 16. Take Williamsburg Way west off Verona Road and look for signs and balloons! There will be a bake sale on Saturday. Come join the fun. The Quarry Hill neighborhood garage sale is also June 15-16 this year. We are located at the southeast corner of the intersection of Lacy and Fish Hatchery roads, across Lacy from the Library and City Hall. There will be signs on Fish Hatch directing you into the 'hood! For the Fourth year in a row, Dane County will hold a free e-waste collection event at the Alliant Energy Center, allowing area residents to drop off unwanted, computers, electronics, and TVs, for recycling, Dane County Executive Joe Parisi announced today. This year’s event will take place on June 16th from 8am until 2pm. Past events, believed to be the largest in North America, have helped prevent an estimated 1.6 million pounds of electronics from going into area landfills. Electronics that will be collected during the event are: personal computers (including keyboards and mice) and computer monitors, printers, scanners, fax machines, television sets of all sizes, calculators, cell phones, radios, stereos, telephones, DVD and CD players, and VCRs. All electronic materials will be responsibly handled in an environmentally, safe and secure manner, using the best data wiping software available. Dane County has developed a system to help move vehicles trough the lines quicker and more effectively. Last year’s event had wait times of less than 5 minutes. The electronics drop-area for the event will be in the back parking lot of the Alliant Energy Center. All vehicles must enter either the main entrance off Rimrock Road or the entrance off Olin Avenue. The free electronics drop off day is made possible through the county’s partnership with Vintage Tech, LLC. Vintage is partnering with electronics manufacturers to cover all the costs of this collection. For more information, contact Casey Slaughter Becker, Office of the County Executive (608) 267-8823 or cell (608) 843-8858, or Jan Neitzel-Knox at Dane County Public Works, (608) 266-4029. Work to implement the County Board’s multi-million dollar, multi-faceted Clear Lakes Initiative is underway. The 2012 budget includes $5.7 million to begin work to remove carp and prevent new infestations in Cherokee Marsh and Mud Lake, clean up beaches, reduce phosphorus, form a new Lake Preservation and Renewal fund, and upgrade storm sewers to keep sediment out of the lakes. The county is working with the DNR this summer to study the carp populations in both Cherokee Marsh and Mud Lake (Roxbury Township) in preparation for possible removal in the winter months; is working with the UW Civil Engineering Department regarding sediment reduction and, in early May, installed floating bog interceptors to monitor the ability to capture sediment and protect the Cherokee Marsh shoreline. The County budgeted $2 million in 2012 to improve storm sewer outfalls so rain runoff does not deposit sediment in the lakes. The Dane County Department of Land and Water Resources has solicited proposals and 10 projects have been submitted. The department will evaluate these projects for funding in the coming weeks. The Lake Preservation and Renewal Fund allocates $3.4 million in 2012 specifically for land acquisitions that will improve the quality of our lakes and waterways. At their meeting on May 17th, the County Board approved the acquisition of 40 acres of land on the south shore of Lake Waubesa that will open 1,400 feet of lakefront shoreline to the public in the South Waubesa Marsh Natural Resource Area. The county used funds from the 2012 Lake Preservation Fund, and partnered with the Natural Heritage Land Trust and the Town of Dunn to acquire lands within the Marsh. The purchase of 40 acres is believed to be the largest remaining stretch of undeveloped, privately owned shoreline along the Yahara Chain of Lakes, and the acquisition will be the County’s first acquisition in the South Waubesa Marsh Natural Resource Area. Strand and Associates, funded by the Clean Lakes Alliance, Dane County, the City of Madison, the Madison Community Foundation, and the Madison Metropolitan Sewage District is developing a detailed plan to implement the September 2010 Yahara CLEAN recommendations (www.yaharawatershed.org <http://www.yaharawatershed.org> ) to reduce phosphorus, sediment loadings, and beach pollutants. The Strand report will not be officially released until November. The 2012 county budget includes $250,000 for implementation activities, and $1 million annually for the subsequent four years. 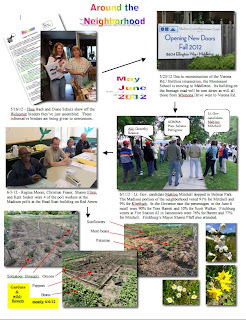 Potential projects include a winter cover crop demonstration and a demonstration of using an Alum treatment to remove phosphorus from tributary streams to the Yahara lakes. The Clear Lakes Initiative provides funds to partner with municipalities to install deflectors to keep algae off beaches. This builds on a program that was begun with booms at Bernie’s Beach and Olin Beach in the last couple of years. In the next few weeks the Department of Land and Water Resources will be installing booms at Bernie's Beach, BB Clark Beach, Olin Park and Warner Park. The Department of Public Health for Madison and Dane County will conduct beach assessments this summer at both Goodland and Mendota County Parks to identify practices that could benefit beach water quality there. Only five months into the year, many of the components of the Clear Lakes Initiative are underway. The initiative is a 5-year, $27 million dollar, effort. The implementation of the initiative demonstrates the county’s on-going commitment to lake health, recreational opportunities, and the economic benefits of lake enjoyment. The ultimate goal of this effort is to improve the quality of life and economy of the entire county. Dane County and its partners will celebrate 25 years of lakes and watershed improvement from June 1 through June 17. Visit www.takeastakeinthelakes.com <http://www.takeastakeinthelakes.com> to learn more. Ever wonder how much water went out through the hose or sprinkler when you forgot to turn it off? The Madison Water Utility is upgrading all water meters to wireless technology that will allow customers to track just how much water they use a day. A annual report flyer from the Water Utility notes that during 2012 and the first part of 2012, every home and business in Madison will be visited either to install a new meter or retrofit the old meter. The completed system will let customers track water usage online daily, received bills monthly, detect leaks, and see savings from water conservation efforts. Currently, customers learn their water usage once every 6 months. Customers will be contacted by mail to arrange an installation appointment. Installation should take no more than 90 minutes. There is no charge to the customer. 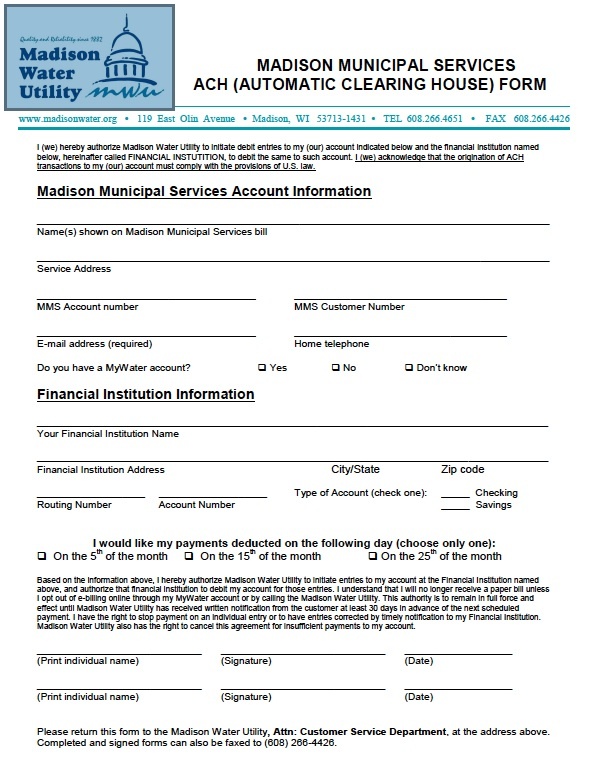 Madison Water Utility customers may now pay their water bills automatically from their accounts. Fill out the attached form and send it in. Customers may choose billing dates of the 5th, 15th, or 25th of the month. Old toilets use a lot of water. 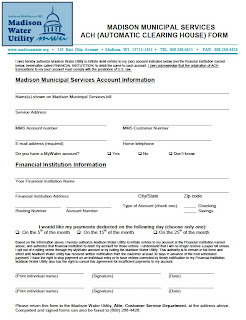 As part of its water conservation program, the Madison Water Utility continues its rebate program. Residential customers in single-family homes or condos can qualify for the $100 rebate. Apartment owners can also claim the rebate. Visti the Madison Water Utility website at www.madisonwater.org <http://www.madisonwater.org> . Fitchburg has a similar program. For more information on the Fitchburg rebate program, call the Fitchburg Utility Office at (608) 270-4270. Does diversity training work to reduce prejudice? Often it does not. But a University of Wisconsin professor has found a method that does. What is it? Markus Brauer, a UW psychology professor, has found that posters showing photos of a variety of people of the same racial or ethnic group who all look different from each other - age, attractiveness, facial expression, gender, skin color, and formality of clothing - and who are labeled with positive and negative traits, reduces prejudice and discrimination. My guess is that it helps the poster viewers realize that people in the ethnic or racial group are individuals rather than simply Black, Arab, Latino, Chinese, or you-name-it. I think the poster becomes a substitute for actually knowing a variety of people of a particular group - something that we of the majority color and culture often don’t. Instead of the negative mental image taking over whenever one thinks of or sees someone of a different color or culture, the viewer “learns” that “those people” are just as various as one’s own group - and prejudice disappears. Tracy Nelson never thought she could be having a stroke. She was a young, healthy woman. Strokes only happen to seniors, right? But at age 42, she suffered a stroke and learned firsthand that a stroke can happen to anyone, at any age, at any time. Fortunately, she survived after receiving treatment from the University of Wisconsin Comprehensive Stroke Program. Today, Nelson has made it her mission to teach others about the signs of stroke and to support stroke research at the UW Hospital. The Fourth Annual Slow Pokes Against Strokes Run/Walk brings together stroke survivors – like Tracy – along with family, friends, and community members to raise money for stroke research that could save the life of a loved one. The fun run/walk will be held at McKee Farms Park in Fitchburg on Saturday July 7th, 2012 at 9AM. Run or walk through 1/2 mile, 1 mile, and 3 mile distances. Same-day registration starts at 8AM. The event is sponsored by Folks Against Strokes, a community group dedicated to increasing stroke awareness and to supporting stroke research at the University of Wisconsin Comprehensive Stroke Program. "Stroke can affect you for the rest of your life, which is why raising awareness of the symptoms and the need for further research is essential to prevention and treatment," says UW neurologist Dr. Matthew Jensen. Every 40 seconds, someone in America has a stroke. Stroke is a loss of brain function due to a clot or bleeding in the brain. It spreads like a fire in the brain. Swift emergency action can limit damage and dramatically increase a person's chance of survival. Stroke kills more women than breast cancer and AIDS combined, and is the third leading cause of death and the leading cause of disability in the United States. Yet stroke research remains disproportionately underfunded. Most people do not recognize the warning signs of stroke or know how to take timely action. The University of Wisconsin Comprehensive Stroke Program provides state-of-the-art care in managing all kinds of stroke, prevention, and rehabilitation. The UW Hospital and Clinics have been designated as one of the top 100 stroke hospitals in the United States. Visit www.folksagainststrokes.com <http://www.folksagainststrokes.com <http://www.folksagainststrokes.com> > for more information and to register. A $20 donation is suggested, which includes a t-shirt. I just came across information that one of the Lt. Governor candidates will be in Belmar Park in our neighborhood at 4 p.m. today, June 1. Belmar Park is at the corner of Red Arrow Trail and Jenewein Road. Anyone who wishes to meet Mahlon Mitchell is welcome to attend. Note: The DMNA does not support or oppose candidates, but it does encourage people to learn for themselves about the candidates. One good way is to see them or talk to them in person, especially if they are in the neighborhood.